In the previous article titled “A BRIEF GUIDE TO CHOOSING YOUR LISTING DESTINATION”, the focus is on the comparison between listing on Main Market of Bursa Malaysia and the Main Board of Hong Kong Stock Exchange (“HKEx”). 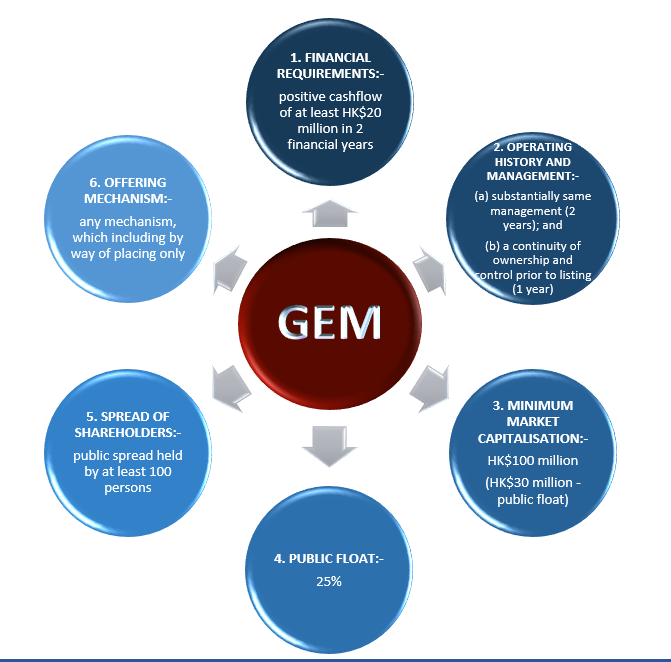 This article (also downloadable in PDF format) is intended to give a brief guide to companies that intend to go for fund raising or initial public offering (“IPO“) by listing their companies on the Growth Enterprise Market of (“GEM”) HKEx, a platform to list before the companies are qualified for the Main Board of HKEx. For example, when you don’t have a track record of 3 financial years, don’t have a HK$20 million (approximately RM10.4 million) of profit after tax for the most recent full financial year. Should you have any query, we would be most pleased to address them. market capital of at least HK$100 million (approximately RM52 million) at the time of listing. supported by reasons acceptable to the HKEx. The expected market capitalisation at the time of listing must be at least HK$100 million (approximately RM52 million), whereby at least HK$30 million (approximately RM16.6 million) must be held by the public. At least 25% of the issuer’s total issued share capital must at all times be held by the public. Where the issuer has 1 class of securities or more, the total securities of the issuer held by the public at the time of listing must be at least 25% of the issuer’s total issued share capital. However, the class of securities for which listing is sought must not be less than 15% of the issuer’s total issued share capital, having an expected market capitalisation at the time of listing of not less than HK$30 million (approximately RM16.6 million). A new applicant is free to decide on its offering mechanism and may list on the HKEx by way of placing only. This year, we have successfully advised on initial public offering of WORLDGATE GLOBAL LOGISTICS LTD (Stock Code: 8292) (“Worldgate”) and FUTURE DATA GROUP LIMITED (Stock Code: 8229) (“Future Data”) on the GEM of HKEx. Worldgate and its group of companies are predominantly involved in air freight forwarding, sea freight forwarding, trucking and warehousing related services in Malaysia. The proposed listing will be on 6 July 2016 and is expected to be the first Malaysian based asset owned by Malaysians to be listed on GEM of HKEx. On the other hand, Future Data and its group of companies are principally engaged in integrated systems and maintenance service, which includes supply and optimization of tailor made integrated information technology systems for the Mass Rapid Transit Project in Malaysia. The proposed listing will be on 8 July 2016. This article shall not be deemed legal advice and does not create solicitors-client relationship. If you wish to know more regarding any legal issues regarding the above matter, kindly contact our lawyers or approach our law firm via the Contact page above.